1.02 Metre (3.3 feet) tall STAINLESS STEEL WATER WALL CASCADE complete with pump and lights. Simply find a spot you like indoors or outdoors, fill with water and turn on. Totally self contained , which means no construction or digging, just Plug and Play. 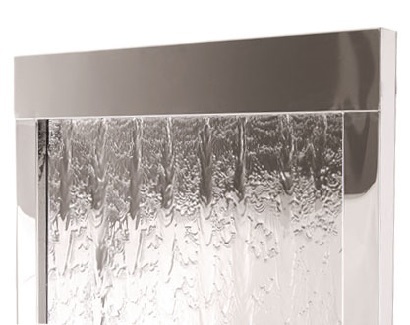 This awe-inspiring flowing wall water feature is made from high quality stainless steel. It stands 1.02 metres tall and is fully self-contained. It is as impressive in offices, reception rooms, restaurants as it is in your gardens. This is a self-contained water feature, containing all you need to get it working immediately. Complete with led lighting up lighters and pump, with a 10m (33 feet) mains cable. No separate extra reservoir is required - the water re-circulates from within a reservoir hidden inside the feature.